Sitting pretty on the banks of the Yamuna river, the Taj Mahal leaves you in awe at first site. No matter what you’ve heard and seen prior to your arrival, it will supersede your expectations. Named one of the Seven Wonders of the World, the pristine white marble structure with its lush green landscaping and pools of water will transport you to another world. In 1983, it became a UNESCO World Heritage site. 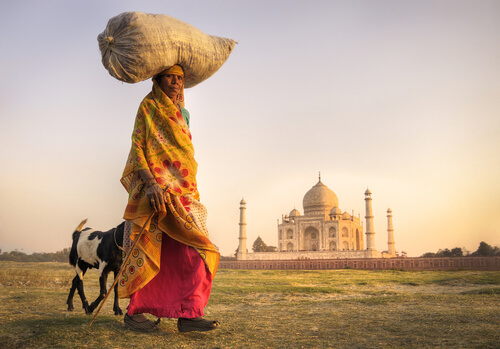 The story behind the Taj Mahal is easily one of the grandest acts of love. Its inception lies in the bittersweet tale of the Moghul Emperor Shah Jahan, who was so besotted with his wife Mumtaz Mahal that after her demise, he vowed to honor her with a gesture that would bear witness to the depth of his love. The construction started in the early 1630s and took two decades to complete. 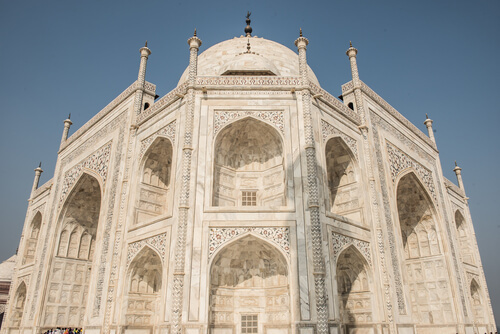 The structure’s perfect symmetry and intricate marble etchings are thanks to the 20,000 expert craftsmen and builders who worked on the Taj Mahal. A short while after its completion, Shah Jahan was imprisoned by his son. While he lived out his last days in captivity his only consolation was a view of the Taj Mahal and a reminder of his beloved wife. Shah Jahan and Mumtaz Mahal are buried side-by-side at the Taj Mahal. While their actual tombs are hidden, there is a representation of it open to visitors. There are three gates to enter the Taj Mahal— south, east and west. Each of them is made from a gorgeous, earthy red stone and each deserves a thorough exploration. Once inside, a bench – known as the Diana Bench – sits mid-centre in front of the main structure. Most tourists will stop to take selfies here, but wherever you position yourself on the grounds makes for a beautiful photo-op. On the right side of the Taj Mahal, closer to the river is a particularly good spot. Food, among other items, is banned from the Taj Mahal largely because of the hungry monkeys ready to pounce on your lunch. There will be a security check at the gates and storage lockers are available at no extra cost. There are no restrictions on attire but be mindful of the weather and dress modestly as you are entering a mausoleum. Visit in the early morning or at sunset when the changing light complements the structure and allows for mesmerising views. There are also fewer people in the early morning, around 6am. While it’s impossible to justly summarise the essence of your visit here, it’s safe to say that the Taj Mahal is a sight that will remain with you for eternity.